Striped Reflective Tape is polyester/vinyl film with acrylic adhesive, that is 3-year engineering grade product. 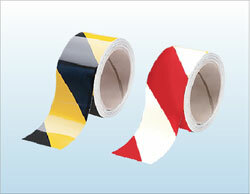 It is used for road traffic signs, barricades, fences, poles, building etc. The colors are available in Black/Yellow and Red/White diagonal stripes, but Red/white is not recommended for long term outdoor use due to fading.